Afghanistan's leader Ashraf Ghani and US President Donald Trump shake hands at 72nd UN General Assembly on 21 Sep 2017 in New York City. Photo: Brendan Smialowski /Getty Image. Can a peace process work if it excludes the government of the country in conflict? We may be finding out. At present, there are two distinct efforts underway to bring peace in Afghanistan: In one, Zalmay Khalilzad, the State Department’s special representative for Afghanistan reconciliation, has held several discussions with Taliban leaders. In the other, a meeting in Moscow this month brought together influential Afghans, including former President Hamid Karzai, and Taliban leaders. Conspicuously what missing from this high-level diplomacy to bring the last peace solution to Afghanistan? Is the Afghan government! Still, efforts to resolve similar conflicts typically involve both the government and the main rebel group—even if, at first, the two sides are talking through an intermediary. That is not happening in this case. Kabul’s absence in this process is remarkable. It would be akin to George Mitchell negotiating directly with Irish republicans while cutting the British government out of the process that resulted in peace in Northern Ireland. 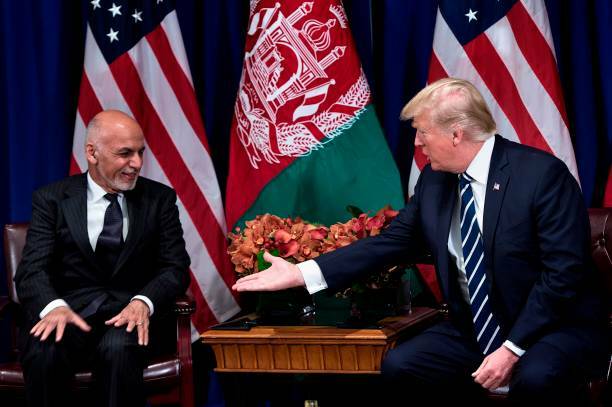 And whatever its final result, Ghani is worried that the U.S.-led effort, especially, is being rushed; that Washington is cutting him out; and that the end result will be a premature withdrawal of American troops. There is good reason for his concern. The Taliban might be making assurances to Khalilzad and to its interlocutors in Moscow, but it is unclear whether those guarantees are acceptable to the Afghan government. “We sense a lot of anxiety in the [presidential] palace,” Borhan Osman, an Afghanistan-based senior analyst for the International Crisis Group, a think tank, said in an email. President Trump told CBS this month that he wanted “to bring our great troops home” after more than 18 years of fighting, but in both Kabul and Washington, there is concern that a precipitous withdrawal will send Afghanistan into a tailspin. The president’s State of the Union speech last week—in which he left open the possibility that a small portion of the 11,000 American soldiers currently in Afghanistan would remain there to focus on counterterrorism—should assuage that concern somewhat, but it won’t do much for Ghani’s feeling of being cut out. There are other reasons for concern on the part of Afghanistan: The U.S. State Department’s own language about talks with the Taliban has undergone a subtle shift in the period since Khalilzad assumed his position. During the Obama years and until at least November 2018, it referred to an “Afghan-led, Afghan-owned” peace process. Those words no longer appear in briefings or statements. When asked at an event at the U.S.
Institute of Peace, a Washington think tank, why the Afghan government wasn’t a part of the process, Khalilzad said that the dialogue was not at the stage where the government could talk directly with the Taliban, and that “a formula” was still needed for the vaunted “Afghan-owned, Afghan-led [process] to really take place.” (On Sunday, Khalilzad began a two-week trip to Europe, Turkey, Qatar, Afghanistan, and Pakistan to meet his counterparts in the peace process. A State Department statement said that he will “consult with the Afghan government throughout the trip.”) Part of the challenge is that Washington and Kabul are disclosing different aspects of their conversations with each other. A U.S. statement describing a phone call last week between Secretary of State Mike Pompeo and Ghani said that the chief U.S. diplomat told the Afghan leader about the American commitment to facilitating an inclusive peace process. When talks began in July between the United States and the Taliban in Qatar, they were expected to pave the way quickly for direct negotiations between the Afghan government and the Taliban. That second step hasn’t yet materialized. The Taliban insists it won’t negotiate with the government in Kabul until, among other preconditions, Washington announces a timetable for the withdrawal of its troops. Those talks, accompanied by the process in Moscow, will serve as confirmation for some Afghans that the Afghan government is either weak or a proxy for a foreign power. (Attempts by the Obama administration to talk with the Taliban during the Karzai era enraged the then–Afghan leader.) There is also a bigger question surrounding talks with the Taliban: Will their words be matched by their actions after the American withdrawal? The Taliban knows Trump’s goal is to withdraw U.S. forces.